An American by birth, Maxim was one of the most successful innovators in the burgeoning field of electricity. Born in Maine in 1840, by 1880 Maxim held over 90 patents in the field of electricity and patented the carbon filament for light bulbs 1 year before Edison. Maxim was so successful and moving so rapidly that industry had difficulty in capitalising on his inventions. So much so that in the late 1870s a business conglomerate named ‘The US Electrical Lighting Company’ agreed to pay Maxim $20,000.00 USD per year for 10 years on the condition that he develop no additional electrical inventions. In 1880 Maxim moved to London, England to spend his enforced retirement. One day early in his stay, Maxim was attending a party talking to people about his future and what he should do. An acquaintance is recording as saying “There is always a war in Europe. You need to make a better weapon.”It is at this point that Hiram Maxim started to develop the concept that would change the world. In a very rapid process, Maxim files his first patent for gas recoil in January 1884 and held his first public demonstration 9 months later. What Maxim did was to develop a gas recoil activated, spring assisted mechanism that would automatically load, fire, eject and repeat without any additional assistance. Virtually every fully automatic weapon system since then operates with these basic principals. Lie a current Colt M4 automatic carbine next to a 1916 vintage Maxim 08 and you will see a gas recoil mechanism with spring assisted forward motion. One weighs 6 pounds and one 60 pounds. They have very different feed and firing mechanisms but still, rely on spent gases for the blowback function and a spring to cycle the action forward and have virtually the same cyclical firing rate. With a cyclical rate of 600 rounds per minute, the MG 08 could provide the firepower equivalent of 20 sharpshooters with bolt action rifles. The Maxim 08 is a development of the weapon first accepted by the German military in 1889. In 1898 the Deutsch Waffen Munitions Fabriken (DFW) started development and modification for production. In 1908 the weapon entered service as the MG 08 (Maschinen Gewehr of 1908). It was a heavy weapon (57lbs) requiring a 70 lb field mount and crew of three. 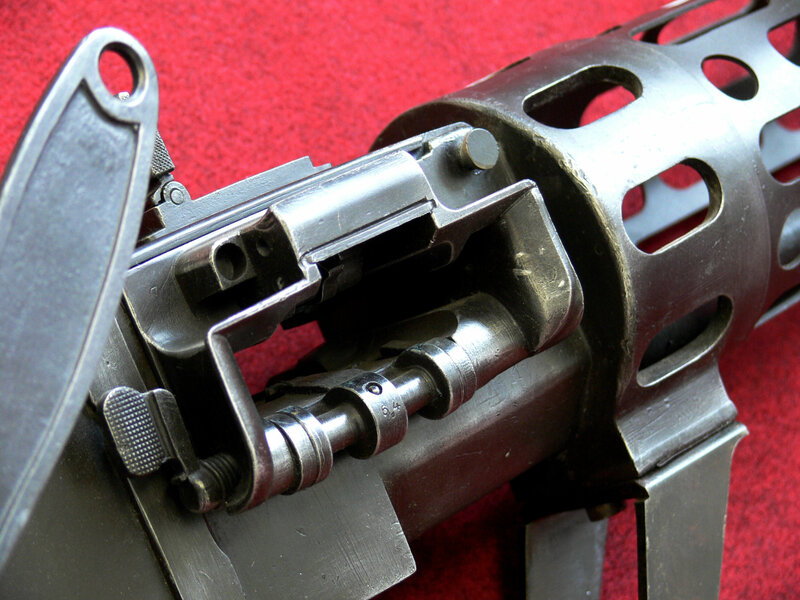 The MG08 is a belt fed, water cooled machine gun. Water cooling was necessary because of the heat generated by friction as the bullets travel through the barrel. 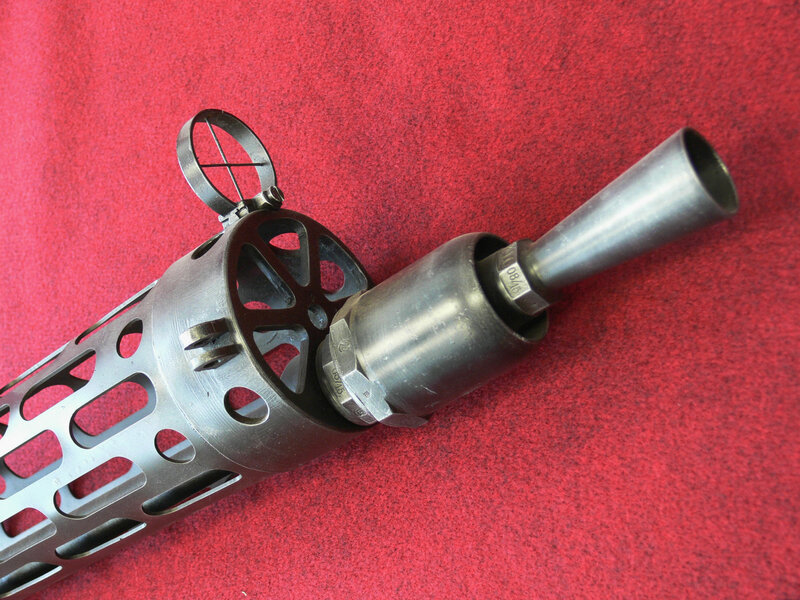 Almost the complete barrel is surrounded by a cylindrical water jacket. As heat is generated, water evaporates passes through an external flexible tube and condenses within a separate canister. This is a total loss water system and the water is constantly being replenished from the condenser reservoir. The water jacket consists of 2 parts, the cylindrical jacket itself which is threaded at both ends and the front end that has internal threads. Behind the water jacket is the trunion, a precise, machined piece that the water jacket threads into at the front and to which the receiver is attached at the rear. Under the center of the trunion is the attach point for the gun mount. The receiver is fabricated with steel sheet sides and a machined floor. The sides, floor, and trunion are attached to each other with flush rivets. The rear of the receiver has a back cover and the top of the box is a steel cover that is pinned at the front to the top of the trunion. All of the above consists of the casing for the actual mechanism. 1. The Feed Block. This device is one of the most visible being situated immediately under the top cover and through which the ammunition belt feeds. 2. The Firing Lock is the ‘’magic’ component of the Maxim. It handles the rounds in several steps: removing from the belt, inserting into the chamber, firing the round, extracting the spent round and ejecting through the lower front of the trunion. 3. The Cross Slide co-ordinates the action of the firing lock and the feed block. Consisting of two parallel rails, the cross slide moves fore and aft within the receiver. Attached to the cross slide and visible on the right-hand exterior of the weapon is the cocking handle used to manually manipulate the action for loading, unloading and rectifying blockages. 4. The Fusee Spring is contained within a cover running the length of the left side of the receiver and is connected to the rear of the cross slide. 6. The Booster is attached to the front of the water jacket. Its function is to boost the blowback action of the gases escaping at the muzzle which initiates the complete cycle. 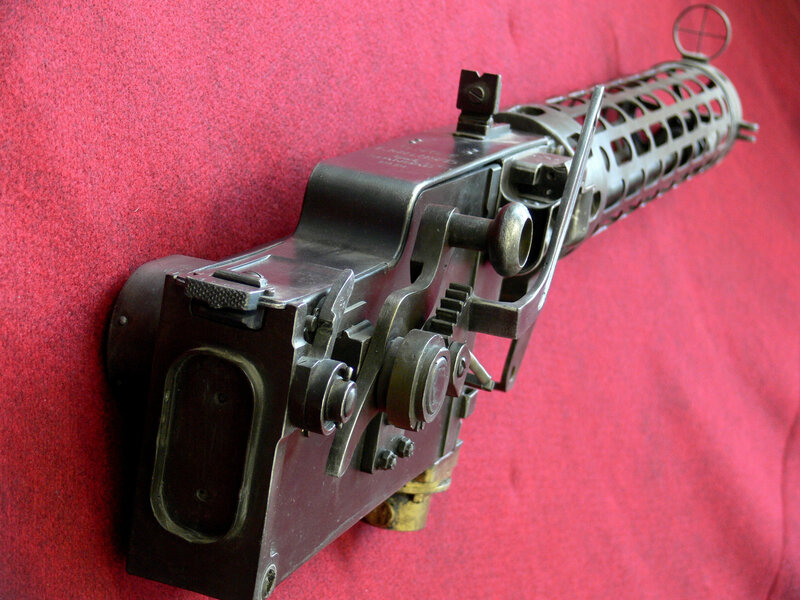 As part of a program to update the original Maxim system adopted by German forces, engineers reworked the 08 patterns with the goal of making the gun lighter and more mobile. The result was the MG 08/15. Externally they are substantially different. The water jacket diameter was narrowed by approximately 2 inches, the receiver was narrowed and manufactured from thinner steel and, most notably, the upper part of the receiver was cut down to remove excess steel. This gave the unique profile known to many WW1 enthusiasts. The Fokker E1 was the first German aircraft to carry a synchronised machine gun, the LMG 08. It was quickly recognised that a water-cooled weapon was inappropriate on an aircraft and modifications were made specifically on the cooling of the barrel. Standard sized water jackets were manufactured with perforations to allow air flow for colling while still retaining sufficient strength for the recoil of the mechanism. The front cover was also perforated and the trunnion was adapted on the bottom for a bolt mount. When the MG 08/15 was introduced into service in 1915 it was soon adapted for aircraft use in a similar fashion to the 08. After modification, the LMG 08/15 weighed 26 lbs compared to the original MG 08 weight of 57 lbs. One very visible modification was the change to the cocking handle (Durchladehebel). Because the guns were fixed and mounted ahead of the pilot, the normal method of clearing blockages, loading and unloading could not be practiced. To overcome this deficiency a series of cocking handle styles were implemented. There appears to be no firm rule as to when a specific style was utilised and it is thought that much of the decision was based on pilot preference. Two other practical modifications were the introduction of rear mounted safety interlocks, a useful adaptation considering that ground crew had to stand in the line of fire during engine start-up, and round counters. While there were several styles of round counters implemented, all were of the ‘rounds remaining’ countdown style. All LMG 08 and LMG 08/15 were manufactured at the Spandau Arsenal and, because of the Arsenal imprint on the Fusee cover, quickly became known as Spandau’s to the Allies. Muzzle velocity: 2,821 feet per second.